I have spent most of the past few months doing two things: trudging through hundreds of pages of Karl Rahner and trudging through hundreds of miles in the Boston winter. No, I am not a glutton for pain, just a graduate student in systematic theology who was training for the Boston Marathon, or simply “Boston.” As April 20 quickly approached, I could not help but see correlations between aspects of Rahner’s theological project and my own quotidian experience of running the marathon. When I mentioned this to my Rahnerian professor, he quickly retorted that “Rahner probably never ran a step in his life,” perhaps a not-too-subtle reminder of this reflection’s limits. Nevertheless, as Rahner himself—aptly dubbed the “mystic of everyday life”— writes, “we might say that mysticism always occurs, concealed and namelessly, in the midst of ordinary life and is the condition for the most down-to-earth and most secular experience of everyday life.” Where might grace be found in the running of the 119th Boston Marathon? I felt great throughout the race. After all, it was Boston. Frenzied crowds cheered (very creatively, may I add…particularly in Wellesley) on runners who were eager to showcase their months, if not years, of meticulous training for this race. I, of course, immersed myself completely into the surreal atmosphere. I gave hi-fives to hundreds of race-watchers, motivated my fellow runners, and gradually increased my tempo as the race progressed. My adrenaline was running—no, bursting—and I felt on top of the world. Even the rain couldn’t dampen my excitement. 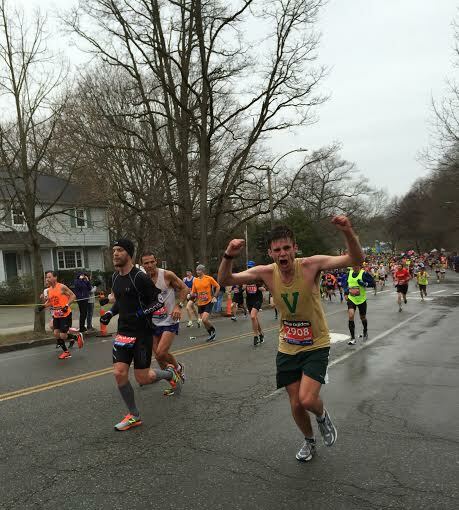 I had friends lining the second half of the course, and after all, it was Boston. I was going faster than expected, and I felt incredible. What could stop me? And, of course, as anyone who has run a marathon knows all too well, that feeling was ephemeral. As we made the sharp right turn 17.5 miles into the race at the Newton Fire Station, the four daunting Newton Hills, cold rain, and a strong headwind awaited me. I quickly saw a few cheering friends, defiantly shouted and pumped my fist at the hills and sped up even more. After all, it was , and I felt great. And yet, it was precisely at this moment (captured in the picture to the left)—when I felt completely in control of the race—that something strange began to happen. And, of course, as anyone who has run a marathon knows all too well, that feeling was ephemeral. As we made the sharp right turn 17.5 miles into the race at the Newton Fire Station, the four daunting Newton Hills, cold rain, and a strong headwind awaited me. I quickly saw a few cheering friends, defiantly shouted and pumped my fist at the hills and sped up even more. After all, it was Boston, and I felt great. And yet, it was precisely at this moment (captured in the picture below)—when I felt completely in control of the race—that something strange began to happen. Muscles throughout my legs began to cramp. I slowed down a little but soldiered on…I still had to prove myself! The hills, hills I had trained on for months, suddenly seemed longer than I remembered. The wind felt particularly fierce as it pushed us away from the finish line. A few miles later, at mile 21 to be exact, still holding the muscle cramps at bay, I could no longer take deep breaths. It felt like the wind was knocked out of me, except it lasted for minutes. I hit the “wall,” and I still had over 5 miles to go. This was Boston. I felt absolutely terrible, like death. For the first time in a race, I wanted to walk. It was the most physically painful and longest final 5 miles of my life. I still cannot look at my mile splits for those final miles. After what felt like an eternity, I non-triumphantly limped across the storied finish line in a time much slower than I had imagined and embarrassingly relied on finish-line volunteers for food and drink. I had reached my limits and been taught my finitude. This was Boston. And, for that famous German Jesuit theologian who never ran a step in his life, this experience was an experience of transcendence, a graced experience of the Whither of transcendence, Holy Mystery. For in Rahner’s theological anthropology—in his linking of the human person’s simultaneously historical and transcendent character—it is precisely our experience of finitude and creatureliness that opens us up to that “ocean of the infinite mystery.” After all, this is the same theologian who wrote that beyond all metaphysical reflection, “real transcendence” is “approached asymptotically at most…in the experience of final loneliness in the face of death,” undoubtedly our most palpable experience of finitude. How can he assert such a thing? “In the fact that he affirms the possibility of a merely finite horizon of questioning, this possibility is already surpassed, and man shows himself to be a being with an infinite horizon.” Indeed, encountering limits—as I did after 21 miles—points to something beyond those limits. It palpably manifests that the world is not me. I am a finite, historical, and created being. This is reality, an authentic experience of my subjectivity. And, in experiencing this creatureliness, I experienced my dependence, my radical inability to control. Despite my pretension to boldly conquer the hills, roads, and weather of Boston, I simply could not control this outcome. In those final arduous miles, I had to depend on the crowds and race-volunteers to merely finish. The human person “comes to the real truth about himself precisely by the fact that he patiently endures and accepts this knowledge that his own reality is not in his own hands.” In experiencing our finitude we learn the true nature of our subjectivity—dependent, social, and yes, even graced. Indeed, on a much deeper existential level are we taught that our “transcendentality is…a relationship which does not establish itself by its own power, but is experienced as something which was established by and is at the disposal of another, and which is grounded in the abyss of ineffable mystery.” Finitude shows that we are not our own makers, and the fact that we can even realize this (transcending the self), shows that this tendency towards self-understanding is grounded in something that is not ourselves. It is hope that grounds this experience of grace through finitude. It is a hope only intelligible through a paschal lens. Seen as such, the finitude of death—crucifixion—does not have the final word, now transformed by the light of the resurrection. Indeed, it is only in light of our experience of finitude that the paschal mystery can make sense. Somewhat analogously, Boston did not end when I hit the wall, and yet it was when I hit that wall that I began to learn who and what I actually was. Both my experience of Boston and my reading of Rahner reveal something profoundly paradoxical: experiences of transcendence and grace do not necessarily come through our achievements and highest points (my triumphantly ecstatic beginning of the race), but rather through our failures and lowest points (my hitting the wall). Nevertheless, Rahner himself warns, “Let each one of us look for the experience of grace in the contemplation of our life, but not that we can say: there it is; I have it. One cannot ‘find’ it so as to claim it triumphantly as one’s own possession.” Indeed, such is the nature of a paradox, a humbling truth that requires a deepening in understanding over years of maturation. These reflections on the experience of grace in finitude, of course, are not limited to my experience on the roads of the Boston Marathon. How much more intensely can this and is this experienced in our everyday lives, simply waiting to be realized. After all, not just runners are a people in via! Lucas Briola will graduate with an MTS from the Boston College School of Theology and Ministry in May. He will begin doctoral work in systematic theology at The Catholic University of America in the Fall. His research interests include ecclesiology, with a particular focus on the Second Vatican Council. Karl Rahner, “Experience of the Holy Spirit,” Theological Investigations (vol. 18), trans. E. Quinn (New York: Crossroad, 1983), 197. Karl Rahner, “The Concept of Mystery in Catholic Theology,” Theological Investigations (vol. 4), trans. K. Smyth (New York: Crossroad, 1982), 57. Karl Rahner, Foundations of Christian Faith: An Introduction to the Idea of Christianity, trans. W. Dych (New York: Seabury, 1978), 35. Rahner, “Concept of Mystery,” 58. Karl Rahner, “On the Theology of Hope,” Theological Investigations (vol. 10), trans. D. Bourke (New York: Crossroad, 1977), 255. Karl Rahner, “Reflections on the Experience of Grace,” Theological Investigations (vol. 3), trans. K-H & B. Kruger (New York: Crossroad, 1982), 89.